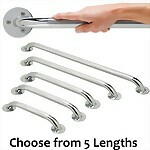 These high-quality, durable 1" steel tubing grab bars include an attractive powder-coated finish to match or enhance bathroom decor and can be installed anywhere assistance is needed. 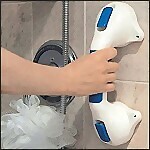 Available sizes: 12", 16", 18" or 24"
Portable balance assist handle attaches easily to shower wall or tub with a single flip lever that includes a unique safety indicator to ensure a secure grip. 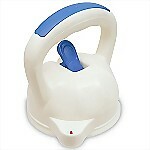 Great for portability or travel! Sturdy 20-guage stainless steel tubing with slip resistant powder-coated white finish includes a concealed screw flange for a more pleasing look. 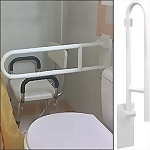 Availalbe Sizes: 12", 16", 18", and 24"
Knurled 1" steel chrome-plated grab bar are easy to grip in wet bathing areas or by the commode and can be mounted horizontally, vertically or diagonally. 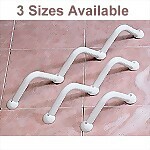 Also use grab bars in the kitchen, along stairways, or in the laundry room for additional fall prevention. 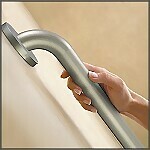 This sturdy stainless steel grab bar offers convenient Flip-Up storage while providing sturdy support when needed. 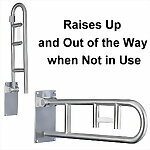 Sturdy 20-guage stainless steel tubing with slip resistant peened stainless steel finish includes a concealed screw flange for a more pleasing look. 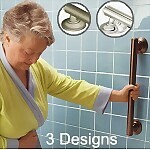 This sturdy stainless steel grab bar provides sturdy support when needed and conveniently flips up and out of the way for storage when not in use. 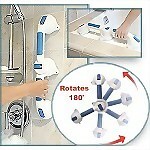 This Multi-Level Hand Grip is ergonomic and stylish. The hand grip is constructed of rust-resistant, heavy-duty plastic with separate gripping compartments, each with its own textured surface. 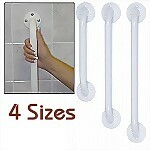 SecureMount patented Designer Ultima grab bar includes curl grip and can be installed at any angle. 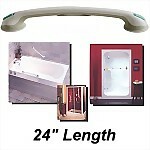 Available in 3 fashionable finishes: Chrome, Brushed Nickel, or Old World Bronze. 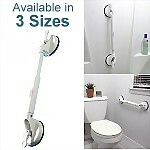 Available Lenghts: 16" or 24"
SecureMount patented Designer Elegance grab bar includes grip pads and can be installed at any angle. 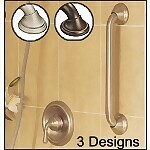 Available in 3 fashionable finishes: Chrome, Brushed Nickel, or Old World Bronze. 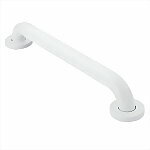 Available Lengths: 16" or 24"
Durable suction grab bars include large suction cups that adhere to virtually any smooth surface to provide assistance, while the adjustable length allows the bar to install in a wide variety of spaces.